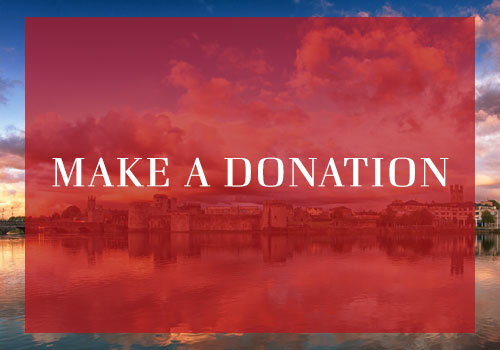 Limerick Civic Trust has organised a number of events to mark the 325th Anniversary of the signing of the Treaty of Limerick. 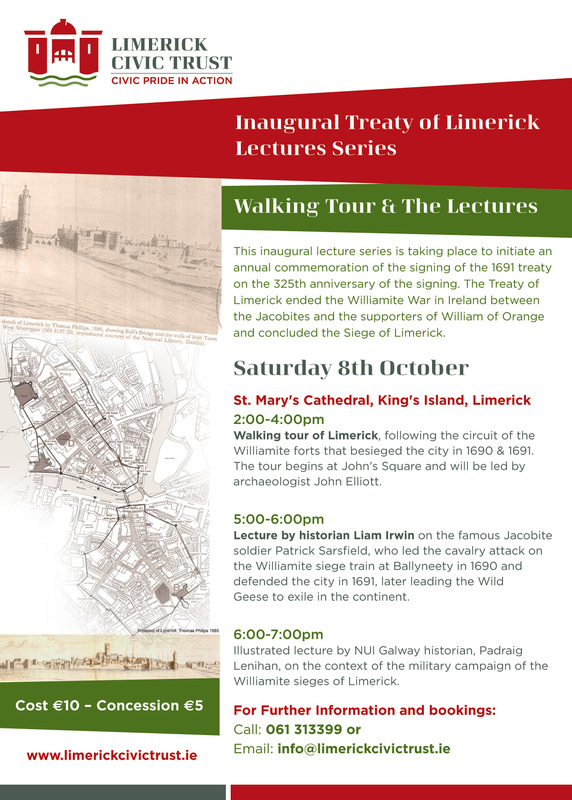 A walking tour and two lectures will take place on Saturday 8th October, kicking off what Limerick Civic Trust hopes to be an annual commemoration of the signing of the 1691 Treaty. The Treaty of Limerick ended the Williamite War in Ireland between the Jacobites and the supporters of William of Orange and concluded the Siege of Limerick. Led by archaeologist John Elliott, a walking tour will depart St John’s Square at 2pm and follow the circuit of the Williamite forts that besieged the city in 1690 and 1691. 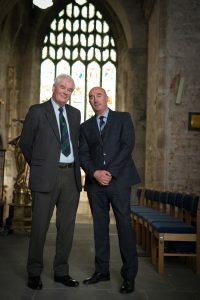 At 5pm historian Liam Irwin will deliver a lecture in St Mary’s Cathedral on the famous Jacobite soldier Patrick Sarsfield, who led the cavalry attack on the Williamite siege train at Ballyneety in 1690 and defended the city in 1691, later leading the Wild Geese to exile in the continent. Also in St Mary’s Cathedral, Padraig Lenihan, historian at NUI Galway, will deliver an illustrated lecture at 6pm on the context of the military campaign of the Williamite sieges of Limerick. Sponsored by UL’s Kemmy Business School with support from the Limerick City & County Council, the six-part series of public lectures will be delivered by internationally renowned commentators and thought leaders in their field. The opening lecture on 7 September will be given by Quentin Peel of the Financial Times. He will be followed by historian and cultural critic Angus Mitchell, professor John O’Brennan, artist Robert Ballagh, Colm O’Gorman of Amnesty International and Dr Ed Walsh (see speaker biographies below).